LG 65UB980V review | What Hi-Fi? The higher the resolution, the bigger you can go with your new screen – and with the advent of 4K comes a massive temptation in the form of this 65in LG. But this is even bigger than most 65in TVs: 156cm wide to be precise, which is 11cm wider than the telly it’s most likely to be compared to on the shop floor, the Samsung UE65HU7500. An 11cm difference might not sound much, but because that’s also the width of the footprint, you will need furniture at least as wide as that, if the LG’s not going to fall over or look ridiculous. The Samsung, on the other hand, will comfortably stand on a piece of furniture much slimmer than its overall width – something you should bear in mind. If you do have the space, the 65UB980V does have a rather striking design, complete with a glowing LG logo plate along the bottom edge. But the real showiness begins when you turn the telly on: bright colours and cartoon graphics form a first-time setup that’s a genuinely pleasurable experience. By the end you’ll have tuned the aerial and/or satellite tuners, connected to the internet, and installed the latest software updates – and then you’ll be right into LG’s new webOS TV experience. webOS is a massive step forward for television operating systems. The coloured card system that appears at the bottom of the screen is designed to equalize channels, apps and connected sources – taking you to content want to watch quickly and with a little bit more fun than you find in the average TV. Previously, we’ve had high praise for the system – and it is definitely a step in the right direction – but having lived with it a little while, we have discovered some issues that are worth noting. The ‘Today’ menu is supposed to give a snapshot of what’s available to watch right now – but it’s not very well implemented. You find six large thumbnails, each representing a programme, but because these are unlabeled stills, only those who know the program well are going to recognise them immediately. Highlighting one of them tells you only that it’s Live, Catch-up or Upcoming, so you have to actually click to get a title and synopsis. Not what you were after? Go back, highlight the next thing, click. Back, highlight, click. And so on. Our understanding when we went to Silicon Valley to see webOS demoed was this feature would allow you to instantly find something to watch, even something unexpected. In its current form it doesn’t do that. Actually, at this point the catch-up programmes suggested come only from iPlayer – 4OD and ITV Player aren’t yet available on webOS, but Demand 5 is, yet it still doesn’t get a look in here, though. And what about using the TV shows available on Netflix or any of the other TV on-demand apps to fill out this section? Doesn’t happen. We were shown a ‘Movies’ page when we first saw webOS demoed, too, and that was supposed to perform a similar function to ‘Today’, but it doesn’t seem to exist on this UK version of the software, so you have to delve into each of the movie on-demand apps individually (alongside Netflix, there’s Amazon Instant Video, Blinkbox and Wuaki). There are plenty of menus labelled ‘Recommended’ in the webOS, but we don’t see any real evidence of curation going on. Whenever it’s live TV that’s being ‘Recommended’ it actually just seems to be all of the channels in numerical order. And what’s with the LG Store section? It’s a page dominated by live TV recommendations (not actual recommendations) and catch-up TV programmes (all from iPlayer, none of which actually worked when clicked on), with only a narrow strip of apps that could be downloaded and installed. Not what we'd consider a ‘store’. Finally, the whole system is just a touch sluggish. It’s nothing serious, but that extra half-a-second pause you get when you change a channel or setting slightly undermines the brilliance of the pointer-like Magic Remote. This may sound like a long list of complaints about webOS, but we don’t want you to be too put off. It does, after all, still do everything a ‘normal’ telly does, but with more colour and joie de vivre. But when you go a bit deeper, you realise that there’s not yet a great deal of cleverness backing it up – and that it still doesn’t do many of the things we were told it intended to do. We’re conscious that we keep saying “yet” – our suspicion is that webOS hasn’t yet been fully localised and optimised for the UK and that it will evolve and improve as more software updates are pushed out. Putting the operating system to one side, the actual picture performance is good. Start with House of Cards from Netflix in 4K (where else?) and you’re immediately wowed by how terrifically sharp and detailed the image is, from the time-lapsed cityscape intro sequence to the furrows in Kevin Spacey’s fantastically fierce face. With still so little 4K content available, you’ll be watching 1080p regularly and the LG does a decent job of upscaling this to match its native 3840 x 2160 resolution: producing images that are clean and stable. Slow pans, both horizontal and vertical, are handled very well when TruMotion is set to Smooth, although it can get a little muddled by very fast action. Overall, though, it’s a decent picture when viewed in isolation, if not quite as good as the current best TVs. Its contrast range is just a little narrower, colours a little more muted, edges a little softer and details a little less fine. Taken individually, these are not big problems, but add them all together and you’ve got an image that’s less striking and less three-dimensional than the Samsung UE65HU7500. The LG’s picture is still good – it’s just that the Samsung’s is truly exceptional. With DVD and other standard-def sources the traits are the same, only more so. The effort required for the added upscaling muddles fast action more, and the image can be a bit ugly. Sound is very impressive. The large TV frame houses Harman-Kardon speakers that have decent weight and clarity, and while the virtual surround feature won’t fool you into thinking you’ve got proper speakers dotted around you, it does fill the room fairly well. There’s a lot to really like here, and while there are flaws in the webOS, we’re still excited by it and convinced that LG is going to improve it to tap its full potential. 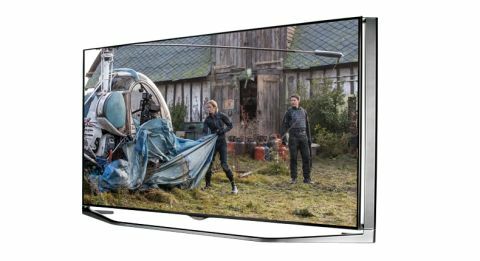 There’s a bigger problem for the 65UB980V though – and it’s the Samsung UE65HU7500, which provides an even punchier, more thrilling and more three-dimensional picture and currently costs around £300 less.